New OpenType functions (Swashes, Titling & Stylistic Alternates) offer even more options for eye-catching typography. This way, you can make individual characters, words or entire sections really stand out. Create brochures, websites and flyers: The new Smart Text Panels enable you to make important text or quotations pop. These adjust to perfectly fit the length of your text. Discover over 70 new Smart Photo Panels & Frames for your projects. These are a popular way of presenting people on websites or highlighting photos on flyers and brochures. The new Arrow SmartShapes enable you to create customized arrow shapes exactly the way you need: Adjust the arrows for width and line style as well as length and curvature. As a hyphen, title or a line for technical drawings: The eight new Labeled Line SmartShapes are fully flexible and adjust their size to fit when text is inserted, or to the length of a unit of measurement. Tons of new SmartShapes: Use fully customizable trapezoids, parallelograms, wheels, pentagons and more to create modern designs for social media posts, flyers or invitations. Modify lines faster than before: The practical preview feature displays changes to line width in real time as you scroll though the selection options. How is a cookie notification created? This guide includes all the information you need for setting up a cookie notification on your website. 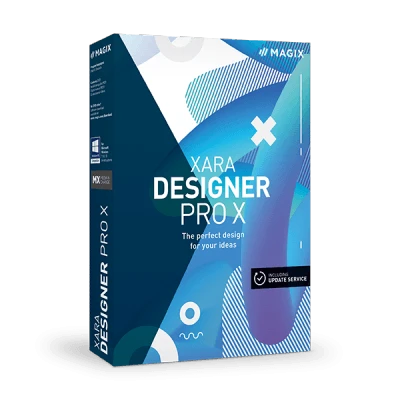 Find out everything you need to know: Browse a huge collection of articles that will help answer your questions about Xara Designer Pro X. For a perfect match between design and photo, use the new Magic Color Match feature to generate an entire color spectrum from a photo in a single click. You can then use this as a basic foundation for your graphics, illustrations or documents. Xara now supports advanced OpenType features such as Stylistic Sets, Contextual Alternates and more. And it includes live preview - just hover over the OpenType feature menu and you can preview the effects immediately. Be more creative than ever. Text will automatically adjust and fit into any shape you are working with. A perfect combination for any document. Lots of new & easy to apply options including ALL CAPS, all lower, Initial Caps and SMALL CAPS. It’s a great time saver! Goodbye to non-aesthetic formatting! The page makeup feature allows you to easily format text and avoid widows and orphans. Bring your productivity to a whole new level with enhanced table SmartShapes, which let you work more efficiently. With an even wider range of possibilities for design, you can create even clearer tables for your websites, flyers and documents! Thanks to improved text and object recognition, grabbing a logo, photo or text from a PDF is now as easy as copy / paste. What’s more any vector design elements remain fully scalable, editable and colorable. Directly import CSV files in easy-to-understand pie charts and tables and present your data clearly across all your documents. Create buzz about your food store online! This website template has been specially designed for the current "superfood" trend and with freshness and vitality in mind. This way you can communicate your vision and what you offer to customers, even before they visit your store. Body and soul, in harmony: Yoga and well-being offers should radiate tranquility from your website in order to attract potential customers. Use our website templates for inspiration, or simply use them as they are. Whichever you choose, your business will benefit as a result. Are you valued by your regulars, but want to attract new customers? Use flyers, presentations and social media posts to boost your restaurant or delivery service business. The new templates can be easily customized to your needs and are based on culinary themes. Fitness is your passion, whether you run a local sport studio or have a fitness blog. Advertise your latest courses or new protein and energy drinks with flyers or presentations. Keep your customers up-to-date with the latest developments in fitness and health. Discover more than 20 new SmartShapes: With new tables, layouts, shapes and text boxes, there's plenty of creative freedom for your ideas. Especially popular: Create your own modern flat designs by adding text to SmartShapes or images. Create the perfect flat design. From now on, there's no need for complicated formatting to get text to fit into a certain shape. Simply choose a Smart Shape, add your text and then use the special handles to move it to the right position. Make your ideas a reality without the need for a professional designer! The selection of new Smart Shapes can be used for presentations, flyers, websites and much more. Modify size and color, add text and your design is finished. Our most sought-after customer request is now available – SmartShape tables. Creating tables for your business has never been easier – lines and columns can be easily moved using handles, re-arranged and resized. Discover new culinary-themed templates for starting your own food blog or creating an Internet presence for a cafe. Whether your want to share your adventures in the great outdoors or enhance visibility for your consultancy firm, these new templates help you give your online presence the perfect format. Want to boost your social media presence? Choose one of our new templates for industries including car sales, fitness logistics and more. Easily convert Facebook posts for other platforms such as Instagram or Twitter. Magic Resize lets you scale text and images to the perfect size. Whether you have a microsite, website or blog in mind, our templates offer crisp, clear design and breathtaking effects. You're sure to find the right template for your project here. Does your presentation feel like it's missing something? Want to add graphics or create a unified layout? Select from a high-quality range of material for presentations - including new designs Water, Travel and Business! New social media templates are included for Instagram, Twitter & Facebook. Not only do they look great, they're automatically adjustable in terms of size. Want to create and print high-quality flyers, leaflets or brochures? Our templates for newsletters and flyers can be perfectly customized to your needs and are available in 12 new designs! With Xara Designer Pro, you can create letters with pre-defined forms or from scratch. There's something to suit every taste. Discover impressive new photo filters that are freely combinable and enable you to create truly unique effects. The wide collection of templates offers the perfect base for demanding design projects. Design top-notch brochures and flyers for products, companies and events. SmartShapes for timelines and planning processes, improved import of PowerPoint documents, optimized import and export for Word and PDF documents and improvements to list editing. First impressions are key! From now on, you can use the full width of your monitor for your slideshows and make your website an absolute eye-catcher. This way, your images will be presented in just the right way to complete your website's message with an artistic statement. Expand the slider any way you want – either with a prominent call-to-action button or a customized header. Now with a total of over 100 photo filters, you can add special improvement to your photos with just one click. Combine different filters to make your images really stand out. Support Support for OpenType font ligatures, new SmartShapes for timelines, improved selection tools for SmartShapes and photo editing, improved PowerPoint import, optimized import and export for Word and PDF documents, improvements to text and list editing and improved HTML export.